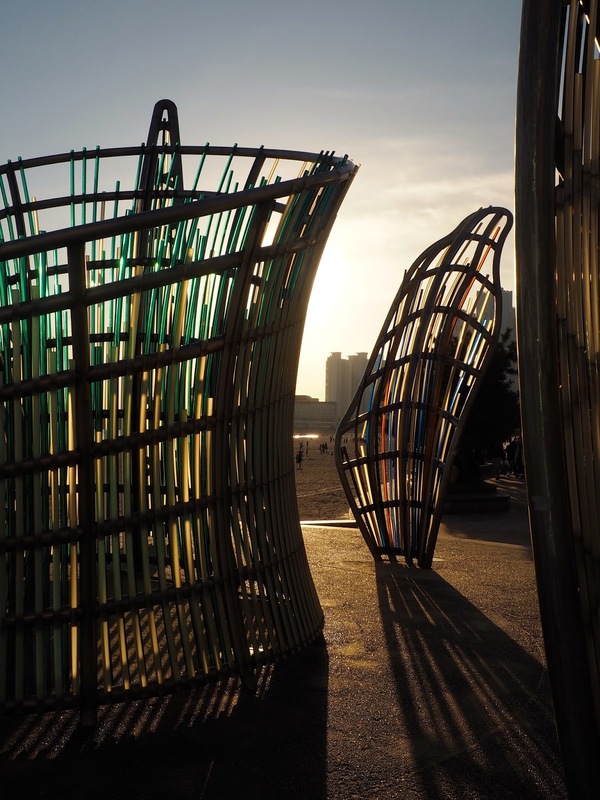 Being a coastal city, Busan has several beaches to choose from, if you want to spend some time in the sand by the ocean. I arrived here at the end of the summer, and the official "swimming season", when there are lifeguards around, ends then too, though you can still swim if you want, so I missed the properly sunny beach weather. That doesn't mean I can't still enjoy the beaches though! I've yet to visit most of them, and some are more difficult to get to, involving long bus or taxi rides. Gwangalli, where the Fireworks Festival is held, is an easily accessible one, with lots of popular expat bars on the waterfront too, and I've spent a few evenings there. Haeundae is the biggest and most popular, as far as I know though. It's a bit further out on the subway (Line 2), depending where you start from, but then it's a short walk down to the sand. I went once by myself a few weeks ago, then again last weekend with a friend. The weather is definitely getting cooler now, but it's still dry and bright, which sounds like perfect beach walking weather to me! It's easy to find the beach from the subway, as it's well signed, and then you just follow the road straight towards the water for about 10 minutes, which brings you out to the middle of the beach. We walked along the path behind the beach, to our right first, sharing our route with many dog walkers. It was a bit later in the afternoon too, so the sun was sinking lower, creating the light effects you see in these photos. Haeundae, like several of Busan's beaches, faces east though, so you won't catch an ocean sunset here, though you'd get a good sunrise I expect, if you dragged yourself out early enough (which is quite popular on New Year's Day I've heard). After a while, we ventured on to the sand - boots are not typically great beach shoes, but as long as we stuck to the dry sand it wasn't too bad. No paddling though! We wandered back the way we had come, passing the road we started at and continuing all the way to the other end of the beach. Even on a cool afternoon in late October, there were still plenty of others on the beach, some walking, others playing games or sports (children and adults alike), and some were even out sunbathing! We even passed a crew filming some people jet-skiing in the water. I'm not sure I would have sat on the beach for a long time, like some people were doing, as there was a cold breeze, but it was nice for walking anyway. At the far end of the beach there's a small pier, with some people fishing from it. We spent a few minutes here looking back at the walk we had just done, all the way down the beach, with the sun setting behind it. Many of the buildings along the beachfront are hotels, which all look to be very modern, and I'm pretty sure they're on the more expensive side! There were a few small motels at the far end though, for those on a smaller budget. The Haeundae area in general is one of the nicer parts of town, as is evident from all the nice buildings around. We walked back towards the middle of the beach, this time taking the path behind the sand again, and by this time we were getting a bit hungry after all that walking. The main road leading back to the subway has plenty of restaurants to choose from, with all kinds of cuisines. Many of them are popular franchises, with other locations around Busan. We ended up having some Mexican dishes in Sharky's (Mexican food isn't that great in a lot of places here, but Sharky's is one of the better choices). There's also Korean, Japanese, Indian, and Western places around, and that's just what we could see and remember now. I'm always keen for a beach walk, but I think this must be one of the nicer times of year to visit Haeundae, as although there's other people around, it's not too busy, and this dry, cool weather is perfect for walking. Apparently in summer (I'm sure I'll witness this next year), Haeundae is jam-packed, being the most popular beach for people to spend sunny days on, so perhaps that'll be the time I venture to some of the smaller beaches around the city! If you're visiting Busan yourself, you may be interested in the Busan City Tour Bus Discount Ticket from Trazy Crew, which includes a stop at Haeundae Beach. I haven't used this tour myself, but am an affiliate for Trazy.